In a fantastic location high up with stunning views, dog friendly winery Hanrahan’s is unusual in that they operate a Reverse BYO policy – ie you can bring your own food as long as you buy their wine to enjoy with it. Dogs are welcome inside the Cellar Door as well as in the outdoor areas. You are most likely welcomed by the local wine dog, Otis, on your arrival! Discovered by Pooches & Pinot | Thanks for the pawsome contribution!! With a beautiful deck with sail shades and umbrellas, and a staggering view, you and your dog can enjoy a wine tasting outside together, as long as you have booked in advance. Discovered by Pooches & Pinot | Thanks for the pawsome contribution!! Winner of the prestigious 2019 James Halliday Winery of the Year award Seville Estate is a dog friendly winery in a league of its own. Sensational wines, fantastic unpretentious food, friendly staff and amazing architecture – oh and some of the best views in the Upper Yarra Valley! Dogs are welcome inside the Cellar Door as well as on the large outside areas to join the wine tasting or a bite to eat. Discovered by Pooches & Pinot | Thanks for the pawsome contribution!! A family run dog friendly winery in the heart of the Yarra Valley on a history rich property cluttered with a crew of passionate folks. 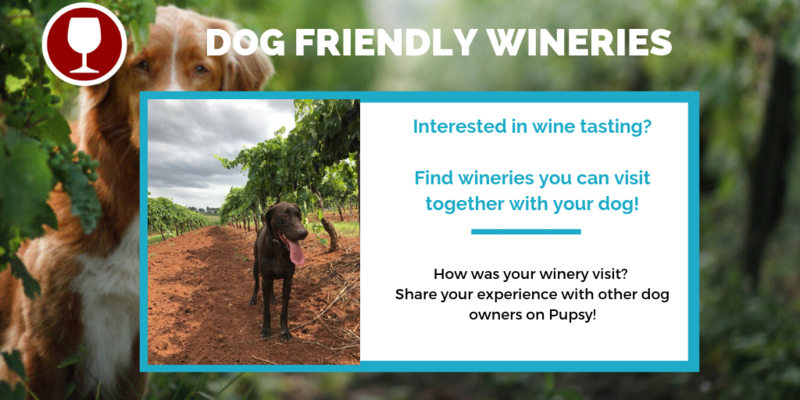 Dogs are welcome to join you for wine tasting (or just a casual glass of wine) on an covered outdoor area. The name ‘Warramunda’ – believed to be Aboriginal for ‘wait for tomorrow’ – aligns with the Estate’s long-term vision of managing a sustainable, productive vineyard. Warramunda produces bespoke wines, which truly reflect the natural expression of the site and provenance of Coldstream in the Yarra Valley. Dogs are welcome on the covered and serviced outdoor seating area. Steels Gate Wines is a dog friendly boutique vineyard and cellar door, nestled amongst the vines with spectacular views. Dogs are welcome on the small balcony outside with steps down to the grass and vines where you can do a tasting or dine with your pup. They also have picnic blankets in front of the vines if you prefer a little more “down to earth” experience. Once the home of world famous opera singer Dame Nellie Melba, dog friendly winery Coombe Yarra Valley is a unique gourmet and cultural destination. Situated among seven acres of stunning gardens, visitors are treated to a world-class dining experience featuring award-winning Coombe Farm wines, against a historic, picturesque backdrop. Dogs are welcome in the outdoor are behind the cellar door with limited under cover seating. Note that wine tastings and dining is not offered outside, however you can enjoy a glass of wine and limited menu through the cellar door (think charcuterie, cheese, scones, tea/coffee, wine). Nestled in the scenic Yarra Valley, dog friendly winery, Immerse, is a breathtaking venue, acclaimed restaurant, boutique winery and state of the art conference centre all rolled into one. Rolling hills of vines, picture perfect gardens, stunning accommodation, succulent food and two beautiful chapels, combine to create the Yarra Valley wedding you dream of (with your pooch being part of it). Dogs are welcome outside in the serviced courtyard, which is not covered but has umbrellas to help with the sun on hotter days. Local wine dogs, Luca and Zya will host your pup at the winery. Subject to other visitors being happy about it, dog friendly winery Maddens Rise allows your dog inside the cellar door. Anywhere outside is totally fine too. At Maddens Rise, the philosophy is to maintain, preserve and where possible, ecologically enhance the natural vineyard environment by embracing the use of ‘biological’ farming practices. Their portfolio of exceptional estate-grown wines is a reflection of the commitment to this core set of values. Mountain Ridge Wines is a dog friendly winery and cellar door located 8km east of historical Berry perched up on a ridge of Coolangatta Mountain, with 360° majestic views to Berry, Saddleback and Cambewarra Mountains, and east to the Shoalhaven River and ocean. Dogs are welcome outside in the verandah area which is covered from sun/rain. Wine tasting is organised on an outside bar area where dogs are also allowed. Dog Friendly winery Bawley Vale welcomes furry friends of all sorts. Dogs just need to be kept on leash at all times as the resident goats might get a little agitated and ducks are roaming in the area. Pack you picnic blanket and head to this beautiful hidden gem with your pooch. You are most likely going to be greeted by the resident wine dog Bree! Cambewarra Estate is a dog friendly Winery with lots of areas for pups to play and rest while people wine taste as well as dine. These areas are under cover and also they can play out on the grass. Dogs are permitted in the cellar door area, however the function center (which doubles as the restaurant ) is an animal free zone.